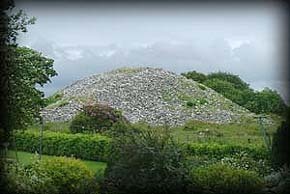 Heapstown Cairn has not been excavated but is believed to be a passage tomb some 60 metres in diameter. The Cairn was much larger but huge amounts of it were removed to build roads and walls, thankfully this has now stopped. The Cairn is about 20 feet high and the kerbstones are visible around most of the it, but as you can see from the picture at the bottom left it is difficult to see if there are any markings on them. Heapstown lies to the West of Moytirra where the legendary Battle of Moytirra took place. Magh Tuireadh (Moytirra) means plain of the pillars and refers to the fourteen megalithic monuments that are scattered around or near this area two of which are featured on this site. The Labby Rock and Moytirra East . 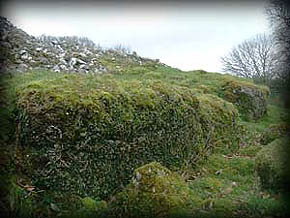 The Cairn is also believed to be an extension of Carrowkeel passage cairns. 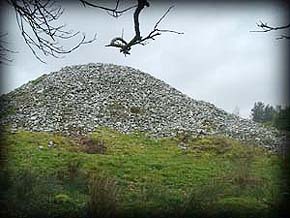 Situated: Travelling towards Sligo on the N4 take a right turn at Castlebaldwin follow the signs for Highwood, after about 2 miles you will come to Heapstown crossroads, take a left here the cairn is in a field on your right. There is a sign pointing to an Historical Trail with a stile next to it. Discovery Map 25: G7721 1628. Last visit Aug 2008.